Sony Xperia XZ2 vs Xperia XZ1 interface comparison: Has anything changed at all? Sony's new flagship phone, the Xperia XZ2, has a new design that differs quite a lot from the slightly older XZ1. The new phone has a curved glass back which is quite different from everything Sony has done in the past. You will find no more rough and square edges on board, which would probably be viewed positively by all those Sony naysayers. However, the lack of a headphone jack is dumbfounding. But has anything changed on the interface side? It's true that we are no longer in the ages when every new phone generation drastically changed the interface of the device. Nowadays, you will be hard-pressed to spot any major difference between the interfaces of two immediate device generations. Has Sony introduced any interface differences on its new device? Let's see how the interface of the Xperia XZ2 stacks up against the XZ1 and see for ourselves. As you can clearly see above, aside from a search box with rounded corners and the XperiaUI interface has hardly moved forward. Not that it is in a dire need of an overhaul, but you will be correct if you feel it is starting to look a bit dated and long in the tooth already, with certain interface elements not exactly feeling like it's 2018. At this point, it probably won't be worth it for Sony to overhaul its existing interface any more, as the alternative could be a bit more appealing - a true stock Android with a slew of essential Sony services and features would probably be a better alternative to revamping XperiaUI from the grounds up. not getting the idea here.. Isn't that Xperia skin is light icing on top of Oreo stock skin? The part that needs upgrade then, is the Android itself i suppose? Yes, aside from the launcher ui and proprietary apps, everything is close to vanilla. Launcher UI is also nearly stock apart from the app drawer which lacks the white background. Let's not forget that vanilla Android comes in slightly different flavours, because Pixel and Nokia launchers are different from Nexus launchers on Oreo. Again poor journalism: first the XZ1 was presented in IFA last year, not MWC. Second, indeed what is the difference here from stock Android except from a keyboard (that anyone can change easily to Gboard anyway). The comment equals "Pixel 2 interface, being stock Android, looks rather dated". All other Sony specific apps that we see here like Music, Photos and Phone are 100% Material Design as Google dictates. Look how the "call" button is a totally Material Design button as if it were designed by Google itself. It is as useless as the following - is there any interface differences between iPhone 7 and iPhone 8? Anyway - the phone is thick as elephant and FPS positioning is killing me - deal breaker for me. Not to mention absence of 3.5mm jack. Sony is trying really had to commit suicide. And this guy - Hideyuki Furimi is less interesting on stage than ent! So let me get this right. Sony's UI is getting long in the tooth but iOS has had the same keyboard for as long as I can remember yet it's ok to leave well enough alone. Guys, there's nothing wrong with Sony's UI. Except for some subtle iconography and adding a dedicated emoji key, it looks virtually the same and there's nothing wrong with that. Design language is key to a product's heritage thus forming a bond with its core customers. What are they teaching in schools now anyway? 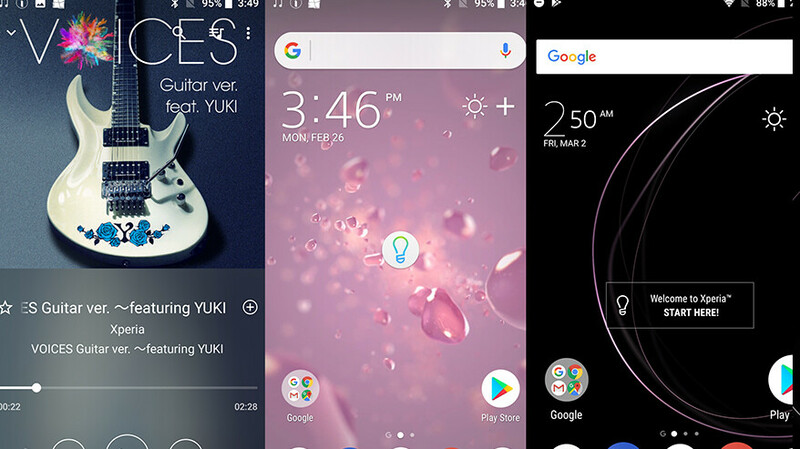 Google launcher looks dated compared to pixel style launcher. And that's keyboard from kitkat era. Care to tell us which part doesn't live up to your high standards? Being 99% stock Android, does that mean that you also don't like stock Android? I prefer performance, simplicity and stability because as i grow older the "flashy" UI no longer looks attractive to me. What's the point of this comparison? I'd rather have a smooth and familiar UI than a buggy and unresponsive new one which takes time to familiarize. For someone who's doing nothing it's okay because there's plenty of time to go though it but if you're a busy person and wants a snappy phone, old but good UI is gold.